What? Two giveaways in one week? Absolutely! I'm very excited to share with everyone that the EEAD Thanksgiving table that I posted recently has been featured on Hostess with the Mostess! 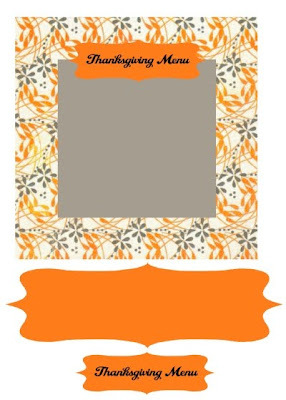 In honor of this, I decided to offer up my Thanksgiving menu and place cards to all of my blog followers as a printable. Just email me your email address or leave it in a comment below and I'll send it to you with DIY instructions so you can print it at home just in time for Thanksgiving! Just make sure you click on the "follow" button on the right sidebar of this blog and become a follower to be eligible to receive this giveaway! This giveaway will end on November 24, 2010. Thank you again to "Hostess with the Mostess" for sharing this with their fans! Hi Alexandra! I'm following you! Thanks for the opportunity! Your Thanksgiving ideas sound like so much fun! Im a Follower! Thanks for the Oppertunity! Beautiful Thankgsgiving table setting Alex. Can't wait to see what you're gonna do next.